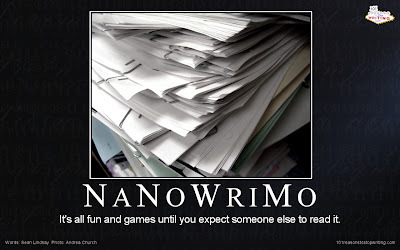 Today is the last day of NaNoWriMo. I finished the first draft of Protecting Emily, and while I didn't get to 80K like I hoped, I did get to 72.6K before the story wrapped itself up naturally. I'm going to go back and reread it and probably find some places where I need to expand. This month has been fun, but crazy. It is definitely hard to write 50K in a month, but last year was a cake-walk compared to this year. That extra 22K I wrote was hard on me - and my poor hubby, who was bemoaning the fact that he missed me by the last week of the month. Oh, and there were those first 5 five days where I wrote 15K and then tossed it all out to start over. Next year I will only write 50k. Maybe 60K. I started re-reading through my first draft, and I'm enjoying it! How's your first draft feeling? Did you win NaNoWriMo? How was your experience? 72K is a great success! I won with 55K and I'm proud of that. So far my reread is going great! It's so fun to read sentences that you don't remember writing...AND loving them! I'm still only 40 pages into my revisions, but I'm happy so far! Can't wait to read your book when it's done! Thanks Amber and Heather! Heather, congrats on 55K and finishing your first draft! I'm pretty much just reading through my book at this point. I won't do a line-by-line edit until I know everything's in the right order etc. Then I'm going to have to clean everything up, lol. Congrats on finishing Nano....and not just finishing but exceeding the requirements. Excellent job! Congratulations! I did not make it. Only 5,000 words for me. But it was a good exercise anyway, because it made me start something and I'm pleased with the storyline. I will continue with the story. I'm doing first round edits on my #NaNoWriMo novel today. Ouch! Not nearly as strong an opening chapter as I'd thought. It's okay. It'll improve. I would love a stronger synopsis. I read in one article that there should be no adjectives in it, just story arc. But apart from that, I don't know what else to do to make it stronger, even after I read your articles. Feel free to critique it. I crave strong feedback. You even have my permission to make the critique a blog post if you want. Be savage. Thanks for your support. It's nice. oh boy. Okay. Let me see what I can whip up, and I'll email you when the blog post is up. I'm never savage, though :) But I do have some ideas on how to make your synopsis stronger. Thanks for the new link, btw! I feel so silly. I thought a synopsis was like an add on the book cover to make people want to read it. But according to Vivian Beck, "Your synopsis must include the resolution to your story." So actually, the synopsis is for the agent or publisher, not for the public. Gosh. That changes everything. I don't want to publish my real synopsis. Too many spoilers for those who might want to read it fresh. So, go ahead with the rewrite if you want to use it as a good example. Given that you don't know the real ending. Live and learn. Loving your enthusiasm. Thank you so much. I'm honored. That's right, Steve. You wrote a blurb - which is all you'd want to post online anyway. So I can help critique your blurb as a blurb, not a synopsis if you'd like. The blurb is an essential part of the query letter you send to agents and editors.